An open statement from Marc van den Dungen, who resigned from the Technical Committee of the KNHS ( Dutch National Equestrian Federation) last year because of concerns over horse welfare in the UAE. His words below remain unaltered. I know, many people no longer want to hear the negative news and now prefer to only receive the positive stories. They are done with the sport being destroyed by the UAE and especially with horses being destroyed in particular. I often read the words: “Does it ever stop?”. No, it does not stop yet. Not before people in this sport start dealing with horses in a decent way. Horse welfare, that was my reason to resign from the Technical Committee of the KNHS ( Dutch National Equestrian Federation) last year. The KNHS allowed UAE horses into the elite endurance team. Horses which, according to the KNHS’s own values, had been pushed far beyond the limits of decency. By doing so, the KNHS put itself in an impossible position: criticizing on the one hand, while benefiting on the other. We all know what happened afterwards: a silver medal and a Run du Colombier of whom we must wonder whether he will ever be capable of finishing an endurance competition again. Fraud by the UAE of unprecedented scale in any sport whatsoever. An entire nation disrespectful of fairness in the sport. A country where horses, pumped full of doping, are ridden to their deaths in front of the camera. A country which, fortunately, no longer has the support of the FEI. The Netherlands has a national equestrian federation, the KNHS (Koninklijk Nederlands Hippische Sportfederatie, Royal Dutch Equestrian Sport Federation), that limits its statement in the media to the conclusion that they have read the FEI press release and pay a lot of importance to horse welfare. The Netherlands has a Carmen Römer who, without any embarrassment, rides an endurance race on a horse owned by: Maktoum. And at the same time even defends this man. That’s a great stable he has! The Netherlands has a Marijke Visser who, we have known this for quite some time now, has exchanged the Dutch flag for the UAE one. Shamelessly proclaiming that she doesn’t think about the problems in the UAE but finds the banishment of that same country by the FEI unfair. The figurehead of Dutch endurance connects herself fully to the despicable practices in the UAE. Her father Erik calls the well-intentioned facebook page “Clean Endurance” a “waste disposal”. The Netherlands has a Maarten van der Heijden. Director of elite sport with the KNHS and, thanks to the silver medal squeezed out of Laiza de Jalima (5 extremely heavy competitions in 7 months time), recently nominated ‘Horseman of the Year’. Even the Dutch youth are dragged into it. Last year, I heard people say that the way the endurance youth is handled in the Netherlands is pedagogically wrong. Here we have Puck van der Lugt, only 15 years old, and by now one of the figureheads in the pro-UAE campaign. You can see her shine on the facebook page “All the good in UAE endurance”. 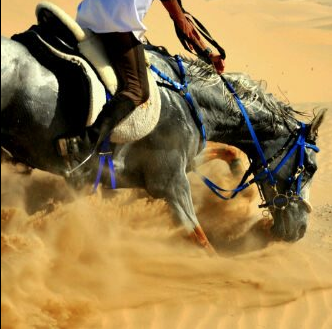 She is taken to the UAE to ride a horse she has barely met one hour before she mounts it. The Netherlands also has Tess de Wijs and Caro de Boer, who simply continue with riding their races in the UAE with loop speeds of 30 km/h. My conclusion: those who take advantage of the UAE or make a profit out of it, accept it unthinkingly. They have to, if they want to continue what they are doing. And the KNHS thinks and researches, just long enough for others to make the decisions for them. To the KNHS, horse welfare is just a definition, a word, a concept. Emotionless. Not very Royal, and more UAE than Dutch even. Equestrian than? Would any of the executive board members have had tears in their eyes when seeing the picture of Bundy with its broken front legs? And what did they do with these emotions? NOTHING. What did the Dutch elite endurance team do? They put up a UAE flag on their social media pages. They praised Maktoum for his good deeds. The stable where Laiza de Jalima, Run du Colombier and Riverwatch ( Starting on WEG 2014) were trained, the stable of which the KNHS thought that it was a good one, the stable on which Carmen Romer was willing to bet anything on its reliability, the stable where she said she had learned so much in the past 10 years, the stable Marijke Visser has to thank for her silver medal, that stable, owned by the Al Qassimi family and whose trainer is Anzaq Mehmood…. Is full of DOPING. Tested positive for testosterone. A young Al Qasimi family member was the rider, Anzaq Mehmood the trainer. Banned for 2 years. Verdict published on the FEI database. Tested positive for banned substance, ridden by another Al Qasimi family member and trained by Anzaq Mehmood. Original verdict is no longer traceable on the FEI site, probably fraudulently removed, but this case is openly mentioned in the Ouarra verdict. Tested positive for banned substance, ridden by Alice Beet, trained by Anzaq Mehmood. Back then, Alice was 19 years old and the Marijke Visser of Great Britain. The subsequent ban of Alice Beet is no longer visible on the FEI website. For the good order, it has in the meantime also become known that Anzaq Mehmood was a trainer in Australia in the past where he ended up being suspended. I only became familiar with the information on these doping cases about a month ago. I immediately shared this information with the KNHS, who was unaware of these facts. I gave them the opportunity to correct their past mistakes. However, the KNHS has not communicated on this subject to this day. Personally, I spoke with Anzaq a few years ago during a meeting of the Dutch elite endurance squad. He told me then that he trained and prepared his horses for competitions without any medical treatments. The famous “I win the Tour de France on peanut butter and jelly sandwiches” story. But we know better now. 1. The KNHS, the Chef d’Equipe and the team veterinarian , Marijke Visser, Joyce van den Berg and Carmen Romer have done business with a stable that has been proven to use doping. 2. All of the above persons have omitted, in spite of the fierce opposition and discussions, to verify the history of the stable and its trainer. This is a primary responsibility of any rider. The discussion, boosted by me, was quickly dismissed with the remark that this good stable was really an exception in the otherwise indeed doubtful UAE, and the trainer an excellent one. This negligence can mostly be blamed on the KNHS, Emile Docquier and Frans Arts. Taking into account the circumstances, they should have done in-depth research and requested additional information from the FEI. This is their responsibility, and this is what they are paid to do. By not doing so, they took a conscious risk and now have to own up to their mistakes. 3. Carmen Romer, according to her own words, has acquired a lot of knowledge from her time spent at these stables. By now, we should start wondering what kind of knowledge it is that she has acquired. Is the KNHS finally going to take serious action against those people who, out of self-interest, still work with the UAE, and against those who have been responsible for using UAE horses while being negligent in the implementation of their responsibilities, while knowingly acting in violation of horse welfare?